England won by 93 runs. Shall we do it all again in Leeds on Friday? Let's do. Thanks for your company tonight and I'll be seeing you soon. Night. "The ball before, Alex Hales said, 'Why don't you swap with James Taylor at point?' But I said, 'I've got it covered'. Everyone went a bit mad. Steve Smith is a big wicket for us. "The coach has just asked me if I tripped over." Terry Mahoney: Well done England and made it with a full 2% to spare. Well in! James Roche: Anyone explain why Old Trafford gets two one-day games? Not sure how that has worked out. 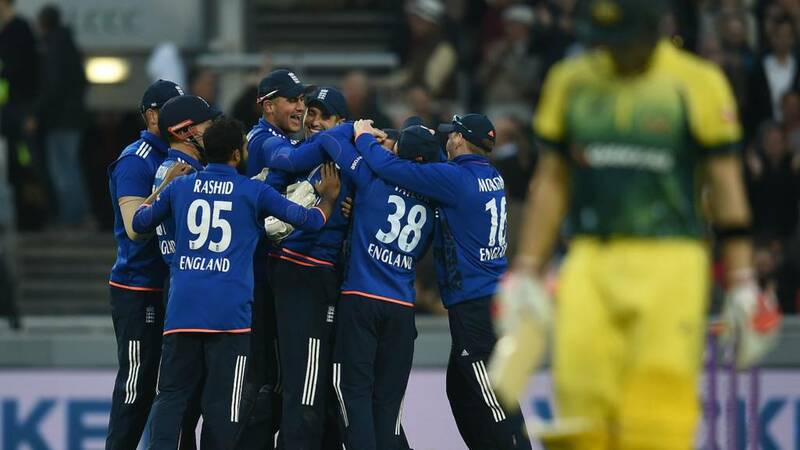 England captain Eoin Morgan on Steven Finn's wonder catch: "It was amazing. I couldn't believe it. Ben Stokes was in my eye line and all I saw was a 6ft 8in giant leaping. "I've known Steven Finn since he was 15 years old and I've never seen him take a catch like that." More from England skipper Morgan on TMS: "The most pleasing aspect was the amount that we won by, given that the shoe was on the other foot for the first two games of the series. "Steve Finn set the tone. Then handing the ball to out two spin wins was quite easy. They took advantage of conditions - 5-70 is outstanding. "James Taylor has come in as a replacement for Joe Root, which isn't easy. But he has done a fine job of it. He has played extremely well." England captain Eoin Morgan: "I'm very impressed. We improved in the areas I asked the guys to from the first two games. Two openers were very good - Jason Roy played his game, lots of strong shots down the ground and then me and James Taylor got a good partnership going in the middle. The pitch deteriorated much more than we thought it would and that played into our hands further into the game. "We played positive cricket, took options when we could. An opportunity came in front of us and we managed to do that. "The spinners were outstanding. The new ball set the tone and Steve Finn's spell was impressive and then the spinners came on and bowled with control and didn't bowl too many bad balls throughout their 10 overs." And James Taylor is given the man of the match award for his role in England's win. And to think some people criticised him. James Taylor, who made 101 in England's 300-8, on TMS: "It's been a couple of games coming for us to get back to winning ways. I got 98 not out against Australia so to get a hundred against them in a winning cause is nice. "I thought we were on for 330, but when you lose wickets in clumps it restricts you. But we got the total that we needed. "Moeen and Rashid did outstandingly. There was quite a lot of pressure on them knowing it's spinning." football live text now. Wayne Rooney is about to take a penalty. Australia captain Steve Smith, speaking at the post-match presentation: "They got a few too many. We did drag it back quite well with the ball. However, with the bat we struggled in the middle overs. The wicket was getting slower. We have to find ways to rotate the strike in the middle overs and then keep enough wickets in the shed so we can go berserk at the end. "Aaron Finch played some beautiful shots down the ground, he's a quality player and we're pleased to get him back in our line-up." Jay: That was really poor by Wade. Why couldn't he just lob a catch to someone? Only Pat Cummins, with eight wickets, has more than Adil Rashid in this series. A fine effort. Djpauly: Catches win matches. @englandcricket held 9, some SPECTACULAR! Back in the series. We're also getting a good idea about England's key men in this series - James Taylor (64), Eoin Morgan (62) and Jason Roy (54) are all averaging in excess of 50 with the bat. Roy's strike-rate is 114, too. With the ball, Adil Rashid has seven wickets at 20.57. "This is great for the series. You want the series to be alive and England have played so well tonight." Australia captain Steve Smith on Test Match Special: "The wicket slowed up quite a bit - it looks like a day-four Test wicket - and the spinners really came into the game. They got 5-70 off their 20 overs. For us, it's about finding a way to get off strike in those middle overs and not give them too many wickets. "We're in a good position - 2-1 up is a good place to be. England can't afford to slip up at all in these last two games, so hopefully we'll put them under pressure." So, the two teams head to Headingley on Friday and back to Old Trafford for the decider on Sunday. Both matches begin at 10:30. Of course, you can follow it all right here. "England needed a guy in their top three to bat through and make a hundred for his country. Taylor did that. Under pressure, he is trying to establish himself in this team." Jordan Forster: Safe to say that was a match winning knock by James Taylor. England win by 93 runs. Ben Johnson: Enjoying Marcus North's gravelly voice on @bbctms. Like a crickety, Aussie Michael Madsen. "That's scoreboard pressure - it's been too hard to overcome for the team batting second." The England team, rightly so, are pretty chuffed with that. The bowlers who took wickets help themselves to souvenir stumps as they congratulate each other on a job well done. Adrian Michaels: Across 9 matches all summer, Eng and Aus have staged 8 thrashings and one close game over 20 overs. Not gripping. "England have outplayed Australia throughout the whole day. Taylor was outstanding and he has been backed up by the bowlers. "They bowled well and their fielding was superb. Coach Trevor Bayliss has talked about making England a good fielding side and, gee, have they done that." A convincing victory is complete for England. They keep the series alive - it's 2-1 with two to play, at Headingley and again at Old Trafford. Full, fast and straight. Stumps splattered. Aussies all out. Matthew Wade is a fighter, giving himself room to hammer four through the covers. Giving it the long handle, he is unlucky not to get six through cow corner. Instead it's a one-bounce four. And again, a boundary wide of mid-off. Denise Evans: So basically, if you bat first in this ODI series, you'll win easily. Steven Finn's back on. Can he put Australia out of their misery? How many chips can you fit in your hand? James Pattinson make a pig's ear of a Ben Stokes cutter which pops up and hits him on the chest. England just want to get this over with now, but the left-hander digs out another yorker. "That was an absolutely diabolical review." David Doxford: Are the Aussies looking to get all their wickets as caught? Is this a record? Ben from Alberta: Odds on the last man will be caught out to make it a clean sweep! Ben Stokes is convinced he's got James Pattinson leg before. Not out but he refers. It turns out the umpire was correct. "The strokeplay reminds me of my five-year-old Archie when I underarm him a few in the back garden." Matthew Wade has batted well against England this summer, he's averaging 98 in the series on the back of that 71 not out in the first game. He hits four backward of square, but the game is surely up now. Jason Roy, by the way, is holding his shoulder after hurting it throwing in from the boundary a couple of overs ago. "One thing that has impressed me in general has been how England have fielded tonight - they have been sharp; they have hunted in packs." James Pattinson fails to connect with a 76mph slower ball. If he had done, we'd be asking the Old Trafford footballers for our ball back. Just four from the over. Adam Hawker: The classic England rope-a-dope. Look like you're incapable then start looking like world beaters. I'm sure I'm not the only one wanting Matthew Wade to pat the ball back to Ben Stokes so he can jokingly return it with interest. The Australian wicketkeeper gets two when he swats the ball through the leg side. Ben Stokes is going to have a bowl. Matthew Wade is the last man standing here, charging down the pitch and carving Liam Plunkett through the covers for four. He's got James Pattinson for company now. "Australia are on the brink of a thrashing." Liam Plunkett takes his third wicket - he's not bowled that well! - when Pat Cummins mis-times a shot down the ground and chips it to Jason Roy at long-on. "What's happening? It's gone pear-shaped." Is it a walrus or is it an opening batsman with a mask on? One thing's for sure, the fella in the background wearing the flat cap (proper Lancashire that) finds it funny. I do too. Moeen Ali's finished with 3-32 on 10 overs. Can he pack up this pitch and take it round with him? "That was a bit slower - he threw it up. He got the little nick and Jonny Bairstow did the rest. Great bowling. Game over." Can somebody tell the Australian bus driver to switch the engine on and get the heaters blowing. The boys will be back on it soon enough. Another sumptuous spinning top from Moeen draws Mitchell Starc into a drive but he can only edge behind where Jonny Bairstow takes an impressive catch. "This is an absolutely phenomenal catch. That is beyond any catch you will see in the outfield. At full stretch going back, he dropped the ball but had the presence of mind to get it at the second attempt. That is stupid stuff. That is the catch of his career." Wowzers. England are taking some sensational catches here. Jason Roy's the man this time, running past a steepler at long-on but somehow palming it into the sky and then getting to Go-Go Gadget arms out to catch the rebound behind him. He defied all laws of physics there. Incredible snaffling. Australia have to take chances now and Wade would have been run out there had Eoin Morgan's throw hit. "With some bowlers you know how they'll get their wickets but I'm not sure about Liam Plunkett. It's usually to do with pace so it either happens or it doesn't." Plunkett continuing from the Pavilion End. The target for Australia now 138 off 78 balls. Will be a good one to win from here, as they say. "I was on a stag do with Steven Finn a couple of years ago." Any other tales of nights out with cricketers? Usual rules apply. "For one moment Alex Hales became a lot better looking than he normally is." Everyone, apart from the Aussies, is having fun at Old Trafford now. Alex Hales is thrown a walrus mask from the crowd and duly obliges - putting it on, to the delight of the spectators. Moeen's latest set of six bring four singles. Liam Plunkett, with his finely manicured beard and coiffed hair, looks a little bit like a Lego figure. He's going round the wicket to the left-handed Ashton Agar who punches a single into the leg side. Just three from the over. El Barrio: Genuinely don't think Liam Plunkett should be anywhere near an England team. He's expensive, he can't bat & his fielding is poor. "England have as good as won this game so far - the spinners have done the job for them. Normally you would have Joe Root as another tweaker on this pitch." It won't be long now, Terry. Hang on in there, son. Ashton Agar is at the crease now. I promise. Moeen is still spinning it square - this looks like a fifth day pitch - and the best the Aussies can manage is a couple of singles. Terry Mahoney: From a bar in Brasov, Romania. Keeping up on live text, but England need to get this done, only 8% left on the phone battery. "Who needs spin when you've got seam bowlers like Liam Plunkett who can bowl back-of-a-length? Mitchell Marsh hasn't looked comfortable at all. You have to say England have won this game - they'd have to do something crazy from here." As mentioned in the last over, Mitchell Marsh is trying to force everything off the back foot and through mid-wicket. It proves to be his undoing when he picks out Chris Woakes. He's on his bike and Eoin Morgan gets a pat on the back for good field positioning. This video does as it says on the tin. You can watch it on the BBC Sport Get Inspired Facebook page. Andy Pandy: That Taylor knock is looking better & better. I may have to take back everything I tweeted earlier. Mitchell Marsh is trying to force Moeen through the leg side, and there's a fielder in position at short mid-on if he doesn't get it quite right. He eventually takes a single to get off strike and then Moeen almost cleans up Matthew Wade who misses with a cut shot and the ball spins over the top of the bails by a whisker. "A good old-fashioned Old Trafford wicket: good to bat on at first and spin coming into it more and more. That was a smashing spell from Rashid." It's mesmerising to watch Adil Rashid. He stands flicking the ball in the air at the top of his mark and then gives it a right, good rip when he delivers. The ball is like a spinning top when it lands - zipping off the surface, one delivery in particular squaring up Mitchell Marsh as it pitches on middle and off and is taken by Jonny Bairstow to his right. "Since the ball's been turning, it has made everyone in the field that bit more interested." I don't know why, but I thought Ashton Agar had walked to the crease. He hasn't - Matthew Wade has. My bad! I'll get my coat. Another over whistles by - just two from it. Moeen's having a ball out there. The crowd is really enjoying itself now - lots of singing emanating from the stands. Adil Rashid, with his sleeves rolled up, is racing through his overs as he tries to give the Australian batsmen the hurry up. Maiden over. Superb stuff. "Bailey will be disgusted with himself because he could have put it anywhere." England are motoring towards a victory now - Moeen Ali's full toss being whacked straight down the throat of Ben Stokes at deep mid-wicket. That's catching practice for the Durham all-rounder. "With the naked eye, that looked plumb. It was the quicker one, it skidded through, but he survived." Adil Rashid is denied a third wicket when ball tracking shows it was hitting the right-hander outside the line and was going on to miss the stumps. Good referral by the Aussies. Adil Rashid pins Mitchell Marsh in front. Back in his crease. Loud appeal. Umpire raises his finger. Out! But Mitchell Marsh wants a review. That is only Moeen's 24th ODI wicket in 25 matches. He averages 41.47 with the ball in 50-over cricket, but he's got the Aussies on the rack here. They were cruising until he came into the bowling attack. "Good bowling from Moeen - he sensed Maxwell was trying to make the charge. Maybe it was one too many - he had done the damage. England very much in the driving seat and they will want to drive this home." The Big Show is now finished. Thanks for coming. Glenn Maxwell goes for one reverse-sweep too many, gets a top edge and Jonny Bairstow takes an easy catch. "This is the benefit of playing IPL and travelling round the world. In a pressure situation, he has just executed two reverse-sweeps, flat and hard." And again. The second reverse sweep in a row. The second boundary through the off side in a row. They don't call him The Big Show for nothing. Glenn Maxwell reverse-sweeps Moeen Ali for four through cover. Astonishing shot. "It makes such a difference for a spin bowler when there is spin and bounce in the wicket." Thanks Justin. Looking good for England now, isn't it? George Bailey and Glenn Maxwell had a chat between overs as they try and work out a way of winning this game. They'll be pleased when Adil Rashid has bowled his full 10 overs. Maxwell is trying to inject some momentum though - the Big Show whacking a full toss to the cow corner boundary. The first four for eight overs. "I think the match-turning moment was when Steven Finn took that catch." Rashid keeping the shackles on. He beats Bailey with a beauty that turns and bounces past outside edge, then almost has him taken by a leaping Stokes at short mid-off. Where's Steven Finn when you need him? Chipperhull: Rashid and Ali both getting big spin on a helpful wicket. Hopefully they will do the same for England this winter. England sense this is their moment. Moeen finding considerable turn, Rashid proving hard to get away, new batsman at the crease, the fans in full voice. Maiden over. Well bowled, Mo. "I wonder if Aaron Finch saw the spin Moeen Ali was getting and thought he'd have to go after Adil Rashid. If so, that's a classic example of bowling in partnerships." Glenn Maxwell joins George Bailey at crease. Rashid gets himself a round of applause at the end of that (match-turning?) over. "Again, it's great bowling from Adil Rashid. He gave it flight and tempted the batsman. Aaron Finch will be kicking himself. What a wicket that is." That's the one that England wanted. Rashid tosses it up, Finch drives... and skies to Woakes, who takes a straightforward catch at deep mid-on. Finch hangs his head, the music pumps out and the crowd goes crazy. Big turn from Moeen and great work from Bairstow as he scampers to collect what England think is a bat-pad chance not far from where short leg would be. But there's no bat involved and Finch survives. Spin from both ends as Morgan tosses Moeen Ali the ball. This match is intriguingly poised. Bailey steers a two back past the bowler, before a single brings the main man Finch back in strike - and while an ugly swipe over mid-wicket isn't going to win any awards for artistic impression, it does take him to 50 from 53 balls - and Australia to 100. "That is as good a stroke as we have seen all summer." Wowee. That. Is. Marvellous. Plunkett over-pitches and Finch unleashes another booming drive that fizzes to mid-off's left. Probably a good job that was nowhere near him - it could have done some damage. The crowd having some fun. Aaron Finch is hit by Adil Rashid's throw from the deep as he makes his ground, and the spectators launch into a mock appeal for obstructing the field. Even Eoin Morgan affords himself a smile. Si Lomas: James Taylor needed about three copies of the Yellow Pages to join in that 'high five' with Finn! Louis Leigh: No wonder he's called Finn. He just leapt like a salmon. Jamie Walton: What was more enjoyable, the catch or the England lads' reactions? Absolute belter! Finch looks the main man for Australia, especially now Smith has gone. He and Bailey manage three singles between them from Rashid, who has conceded only eight runs off his three overs. And that's drinks. "Hasn't Finch been brutal down the ground? He's not been playing much cricket but looks in the form of his life." George Bailey, the new man, has the best seat in the house as Aaron Finch drives Plunkett for another textbook four - on the ground all the way. Kieron Etheridge: What a catch Steven Finn. Instantly one of my favourite cricketing moments! Andrew Lawton: I don't think I've ever seen a fast bowler take a catch like that. Incredible. England's celebrations said it all there - a wide-mouthed Alex Hales charges in from the boundary. Finn, the coolest man on the pitch, jogs backwards with a ever-widening grin on his face before his team-mates smother him. Brilliant stuff. "I can't believe that wasn't Ben Stokes. My first instinct was that Stokes had taken another blinder. What is Steven Finn even doing fielding there? This is up there with anything Stokes has caught this summer." Stunning. Simply stunning. Steven Finn, of all people, takes a blinder at short mid-wicket, diving full length to his right to pluck that wristy flick from Smith out of the darkening sky. How on earth did the big man manage that?! "If James Taylor was 5ft 7in, he'd have got to that." Maybe a change of ends will help Plunkett, who is lumbering in now after Finn finally takes a blow with figures of 1-29 off seven. "Adil Rashid always bowls an off-spinner first up - it's always flat and dragged down. Maybe it's a lack of confidence and he just wants to settle into the over." Rashid rattles through his first over - and gets away with a half-tracker as Finch swats him to long-off. Not loads of spin there - he's pushing them through rather than ripping them. Time for spin. Adil Rashid gets a whirl. Si Lomas: Why aren't the seamers trying a few cutters? White ball rarely swings but this pitch is gripping so try something different. Smith is averaging a boundary an over, this the least convincing of them as he inside edges past wicketkeeper Bairstow. Finn in for his seventh over. A good old opening spell, this. "Aaron Finch looks a bit like a rugby league player to me. Big, strong and with a bit of stubble." Plunkett, all stiff limbs and straight arms, looks like he's being controlled by a puppet master as he runs in. Finch pings him back over his head for four and the Yorkshire seamer has conceded 17 off his first two overs. "Every time I see the ball zero-ing in on Steve Smith's pads I am up for an lbw appeal. And then it comes off the middle of his bat." Smith is on the move. He takes a couple to third man, then whips Finn to square leg from right in front of middle stump, and misses out on a pulled four only by a smart stop from Moeen at mid-on. Earlier, it was suggested by Rob Meech (44 overs) that Ben Stokes is "miles ahead" of Andrew Flintoff at the same stage in their careers. We've done some number-crunching - comparing the two after 32 ODIs - and Flintoff edges it. Certainly with the bat. The 50 is up but Finch is almost run out seconds later. Smith pushes to the left of at cover and calls his partner through. Finch isn't quite as quick as his captain, though, and he would have been gone had James Taylor hit. Finch may have a reputation as a bit of a dasher at the top of the order, but some of the strokes he has played tonight wouldn't look out of place in the MCC coaching manual. A back-foot forcing shot straight back down the ground earns him four. Delightful. Time for Liam Plunkett, on in place of Woakes. Bob in France: England just seem to have forgotten Big Bres, who can stop the run flow and can also score runs. Why? There are plenty of fleeces and hoodies in the crowd on this Manchester evening, and a fair few arms folded to keep in a little bit more warmth. Let's hope they've got another layer for later. Finch can't get Finn away - a valuable maiden. "The impressive thing about Steve Smith is that whenever he gets a chance to score, he always finds the gap. His placing is immaculate." Woakes, all floppy fringe and crimson cheeks, to continue - and was Smith just limping a little as he scurried that single? Maybe not - he strokes Woakes through cover for four. He already has twice as many boundaries as James Taylor managed in his first 50 runs. "Australia bat down to number 11 today - Pattinson, Cummins and obviously Ashton Agar can all score runs." Boos ring round Old Trafford. That must mean the Australia skipper is walking to the crease. The Mancunian cricket public haven't forgotten about that incident at Lord's on Saturday with Ben Stokes. Smith isn't too bothered and he drives uppishly through the covers for the boundary which gets him off the mark. "Burns was trying to hit Finn over the top and miscued it completely. Morgan was hamstrung by Jason Roy, who had no right to go for that one. He made a regulation catch for Morgan almost result in a hospital trip." England break through! Burns tries to work Finn to leg but a leading edge loops into the off side. It hangs in the air....and Eoin Morgan avoids the onrushing Jason Roy to claim a smart low catch at mid-off. "For a while now, England have lacked a wicket-taker who you can throw the ball to and you know he'll get you a couple of wickets when a team is going well." Finch is feeling it here. First he pulls Woakes with power through square leg, then he goes straight. The last ball is a rather less convincing inside-edge on to the back pad. "This is the hotbed of England cricket. It's an urban myth that it always rains up north. It rains more in Birmingham. It's always nice here." Different bowler, same story. Finch punishes Finn for over-pitching with another meaty aerial drive over wide mid-on. He even holds the pose. "Did you get that, snappers?" Bosh. Finch, having had his sighter, drills Woakes over mid-on for an emphatic one-bounce four, the first authentic boundary of the innings. Glorious. Ruins an otherwise decent over from Woakes. "That's five runs for a push into the off side. There was not much chance of a run-out there." Some rather worrying figures for England fans flash up on my TV screen: only once in seven ODIs this summer have they taken more than two wickets in the first 25 overs. Four overthrows - James Taylor shying and missing as Finch nabs a single to cover - will hardly help. Finn's mood is not improved when Burns almost plays on off the last ball. Louis Strong: Woakes isn't an opening bowler sadly, currently he is just filling in. We need variety, like Willey, not to be safe. Interesting. Burns blocks one so hard into the pitch that it bounces up over Woakes and it needs a scrambling Eoin Morgan at mid-off to prevent it going for more than single. Good over for Woakes and England. Ralph Brooker: BBC licence fee, £145.50. David Lloyd's on-air Fred Trueman impression, priceless! That's better. Finch is off the mark first ball too but that's the Aussies' lot for the over. A slightly weird misfield - Ben Stokes the culprit as he runs past the ball - gets Australia off the mark with a single from the first ball of the innings. Steven Finn isn't too amused. "England should be defending 330-340 from the position they got themselves in. Once Eoin Morgan was out, the England innings stuttered. Glenn Maxwell's figures of 2-56 betrayed the way he played. He should have gone for more runs." Thanks Mitch. Joe Burns and Aaron Finch make their way out for Australia. So can Australia make some history by chasing 301 at Old Trafford or will this be the start of England's comeback in this series? Stay tuned. After an entertaining chat with Bumble, we're not far away from Australia's run chase - time for me to hand you to Justin Goulding to talk you through the next part of the game. Gabriel Counsell: A century and the plaudits for Taylor. An Eng no3 batting through for a ton. Isn't that what we criticised Trott for? Colin R Docherty: Australia should get these runs, England's bowling lineup just isn't good enough. Tan: England are a strong team... they won the Ashes... don't be so negative... we will surely win...score is 300 folks. Chris Adams ‏(not THAT one): Another steady innings from Taylor. He warrants a Test call-up given Ballance and Lyth's recent Ashes performances. Vic Phillips: Do those grumbling about England's batting remember where we were at the World Cup? Pretty sure things have improved a bit. Ex-England batsman and coach David Lloyd on TMS: "I was mortified that they were offended. It's a northern phrase, it's as if we had played them at football, missed a penalty, hit the bar and somehow it was 0-0." Richard Higgins: 309 & 305 two winning scores so far. Why is 300 so terrible?! Could have had 20-30 more, but we've fallen apart in previous two. Ian: I think Australia will win comfortably by 5 or 6 wickets but please prove me wrong England. Ex-England batsman and coach David Lloyd on TMS: "I was never going to replace Geoffrey Boycott in the Test side - reality meant I came up against Thomson and Lillee in Australia who were too good for us. I played nine Tests and eight one-day internationals. I even got a hundred against Pakistan in a one-day international when Tony Greig said we were out of sight. They won with nearly 10 overs to spare..."
Kush in London: Taylor was brilliant. What does he need to do to appease his critics? Maybe change his name to Joe Root? Ex-England batsman and coach David Lloyd on TMS: "Barry Wood, Frank Hayes and Peter Lever went on strike for better contracts while I was Lancashire captain. We once started a game with 10 men." Richard from Devon: Great news for KP going back to S Africa re 20/20. He says it feels like a homecoming. Let's hope for all of English cricket he stays there! Mark Fawcett: Eng ODI batting lineup reminds me of Eric Morecambe - "All of the right players but not necessarily in the right order". Squawkthetalk: With such a deep batting XI, Rashid at 10! - England are 30-40 shy of what they shouldve got. Could be a tight chase! Kevin Pietersen has signed for the Durban-based Dolphins franchise in South Africa's Ram Slam T20. The 35-year-old, England's combined highest run-scorer across all formats, was sacked after the 5-0 defeat by Australia in the 2013-14 Ashes series. Pietersen, who was born in Pietermaritzburg, said: "I look forward to playing good, winning cricket. Every time I come back to South Africa it feels like a homecoming." The Ram Slam, South Africa's domestic T20 competition, runs from 1 November to 12 December. Jordan Forster: Bit of an old-fashioned knock from James Taylor. Hard to judge whether he anchored a good score or denied one. Old Trafford record on the line? Ex-England batsman and coach David Lloyd on TMS: "My mother was a tyrant, she used to chase me with a frying pan and hit me with it. She came from a family of 15 brothers and sisters. My dad was a very religious chap, a lay preacher." Bowling figures: Starc 10-0-79-1, Pattinson 6-1-36-0, Agar 9-0-45-1, Cummins 10-1-50-2, Maxwell 10-0-56-2, M Marsh 5-0-28-0. Ex-England batsman and coach David Lloyd on TMS: "Why is the book called 'Last in the Tin Bath'? I lived in Accrington, we had an outside toilet and no bathroom, but we had this tin bath. Every Friday night it came out, my dad got in first, then Uncle Eric, then me, and the water was filthy by then." TMS will shortly be speaking to former (deep breath) England and Lancashire batsman, England and Lancashire coach, first-class umpire and TMS summariser David "Bumble" Lloyd - now a familiar face on Sky TV's cricket coverage. He has a new book out. Mike Ball: Taylor gets a century when everyone around him was getting out yet still people aren't happy. England's James Taylor, who scored 101 off 114 balls, on Sky Sports: "It was nice to get finally over that line. "The last couple of knocks I gave it away. I was itching to play the odd more attacking shot but I had to rein myself in, especially as Morgy was playing how he was at the other end. "It wasn't an easy pitch to score on and that just shows what a special knock it was from Morgy to play how he did." So, who's your pound on here? Australia have scored 305 from 50 overs and 309 from 49 batting first in the first two ODIs, but without that all-important scoreboard pressure. "The Australian guys will know they could have been chasing a lot more than 300. But England will be confident, knowing Australia will have to bat really well to chase this down." "That 300 is enough for England to defend. They have given the spinners something to bowl at, and Ashton Agar showed this pitch does suit the spinners." A low full toss is punched back past the bowler by Woakes as England finish with a round 300. Woakes and Rashid manage a single apiece. England up to 299 with one ball left. Woakes facing. Rory Stoves: Criticism of Taylor is outrageous. Without him we'd be around 240. It's not as if he doesn't hit boundaries. Big hit! Woakes (joined by Adil Rashid) confidently hoists a six over mid-wicket. "It's a fantastic knock, he should be proud of himself. He's the guy England have batted around. The trend in this series has been players getting starts and then getting out but he's gone on and got the three figures today."